From turkey to potatoes to pumpkin pie! Save money on your Thanksgiving dinner with our Texas energy-saving tips! How Can I Use Less Electricity For Thanksgiving? Thanksgiving is almost here and so is the task of preparing an incredible dinner for all of your family and friends. But while the holidays can be stressful and expensive, you can still lower your Texas energy bills. Just follow these five tips to reduce your electricity bill while preparing your Thanksgiving feast. Set a timer.By using a timer, you’ll cut down on overcooking or burning the food. This means great tasting food without wasting excess energy. 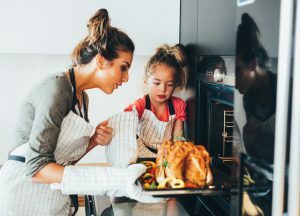 Keep the oven closed.Opening the oven before the turkey is fully cooked to “check on it” rapidly decreases your oven temperature, resulting in longer cook times. If you need to check on it, use the oven light and look at it through the glass. Cook multiple dishes at once. Using extra space in your oven to cook more items at once can help reduce the amount of time your oven is on and lower your energy bills. Avoiding this one oven myth is an easy way to reduce excessive electricity use this Thanksgiving. While some dishes benefit from preheating, a turkey doesn’t. It may take slightly longer to cook, but it’s a great way to cut costs because your oven won’t be wasting energy while its empty. One easy way to cut down on energy use is to properly maintainyour refrigerator. Check the door seals to make sure it’s closing properly and keeping your food cold. When removing items to cook, take everything you need out at once to limit the number of times the door is opened and closed. Use an ice chest for drinks. It’ll keep family and friends from going in and out of the fridge and also out of your hair while you’re cooking. People create heat. If you have a lot of people coming over for dinner, don’t be afraid to lower your thermostat a few degrees. It may be colder at first, but with all the cooking and conversation, you’ll find the house will rapidly heat up. What’s the Most Energy Efficient Way to Clean Up? The dishwasher is still the most energy efficient way to clean upafter your big meal. Get the most out of each run by making sure plates are scraped clean and that you pack the dishwasher full. Allowing dishes to air dry afterwards can further increase efficiency. You don’t have to wait for Thanksgiving to start saving big on energy bills. If you use your power to choose, then you have options. Whether you’re interested in a smart thermometer plan in Dallasto help you monitor your energy use or you’re simply looking for the cheapest energy rates, we’re here to help. For more information on comparing electricity company ratesvisit www.TexasElectricityRatings.com. You can shop and compare energy providers before you switch to the best electricity plan for your specific needs.